To my surprise, Oliver soon picked up the idea, started to grow his own sourdoughs and with the help of Lutz and Petra (both German food bloggers) his bread repertoire began to grow slowly but steadily. His technical background led to countless spreadsheets, rise & proof time tables and records of recipes that worked well right away and ones that needed a couple of trial runs until he was happy with the result. Today we rarely buy bread anymore, home baked sourdough loaves definitely do spoil your taste and many commercially produced breads (even some of the smaller neighbourhood bakeries) just can’t keep up. 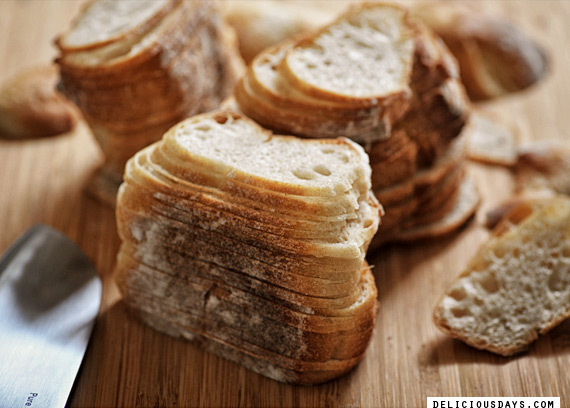 Besides, there simply is nothing better than the scent of freshly baked bread in your kitchen! Since Oliver doesn’t get tired to try new recipes I’m constantly challenged to find good use for stale breads of all kind. Some cooking ideas I’ve experimented with, I quickly disregard, but then there are those rare ideas that blend into your daily routine from the first attempt – and you can’t imagine ever having lived without it. Today’s recipe is of that nature and I can only urge you to give it a go. I’ve seen something similar done to stale bread many years ago on a TV show by German chef Alexander Herrmann. I believe he used a second tray to weigh the bread chips down, something I wouldn’t consider necessary, even less so as I like how the slices slightly bend and twist through the roasting process. The chips work great as a one-bite-snack. Or a series of them, like…going into the kitchen, opening the airtight bowl, taking one out, nibbling on it for 3 seconds while returning to your office desk before feeling the spices kick in. And immediately feeling the urge to jet back for another – single – piece. 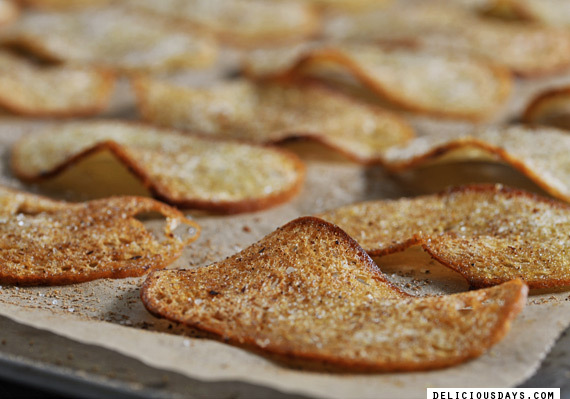 This recipe is more a description of how to do the bread chips than an exact recipe. The amount of oil and spices depends on your personal taste & preference (hot, spicy or mild – salty or just a little seasoned) and growing experience in preparing them. If you end up with under-seasoned chips, you can always add some spices afterwards. After baking some trays you will know how much seasoning they can take. You can use almost any kind of stale white bread or bread rolls, as long as the crumb is rather even and compact. I’ve tried a very airy baguette with huge holes, too, but the chips don’t hold their shape as nicely. Preheat the oven to 200°C (390°F) and line one or two baking trays with parchment paper. Cut the bread (rolls) into – preferably – equally thin slices (~2 mm is perfect) and drizzle with your favourite olive oil. I usually spread the bread slices in my bain-marie bowl and drizzle each layer with a little olive oil, then toss them a couple of times until all of them are lightly covered in oil. Distribute them on the trays and sprinkle with fine sea salt, finely ground chili flakes or cayenne pepper and finally a generous dust (I use a fine mesh sieve) of garam masala powder. If you have a fan-assisted oven, you can bake both trays at the same time (one top level, one at the bottom, rotate after 3 or 4 minutes), if not, bake one after another (on middle level). Just make sure to check back every minute during your first baking session, similar to nuts they can go from pale to burnt within no time! Take out once they are golden brown, let cool completely on the tray, then take two opposite sides of the parchment paper and carefully let them slide into a sealable bowl or airtight container. That way they keep crisp for two weeks and longer. Done? No, wait, the best part is yet to come. Since I prepare these nearly each and every week with different bread and bread roll leftovers, we hardly ever run out of them. On the contrary, we sometimes have too much and so I started to crush the older ones by hand (more coarsely) or with a food processor (finely) and used the crumbs to take some everyday dishes to the next level. These spiced breadcrumbs can work wonders! You can top gratins or pasta with them (coarsely crushed). You can coat oven roast vegetables with them (finely crushed). You can sprinkle them on salads (coarsely crushed). You can bread fish/meat/cheese/etc. with them (finely crushed). Breadly Pleasures called Bialystoker Kuchen. Or Bialys. I still haven't mastered to bake my own bread, but have stale bread from time to time too. This sounds easy and doable, have to try it. I love this idea. Kind of brings to mind those little pumpernickel chips that you find in snack mix sometimes... but better by a factor of a million. 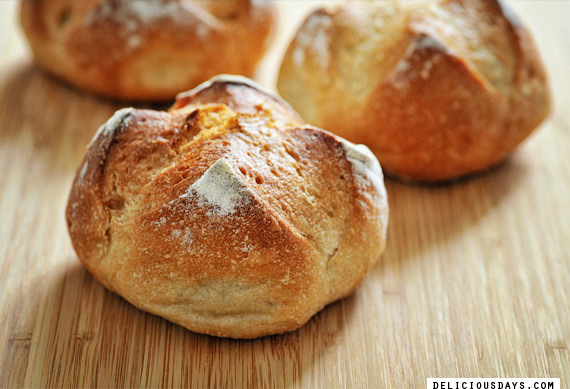 I'm always looking for uses for leftover bread, too...these look absolutely perfect. As always, you give me such great inspiration! What a great idea. 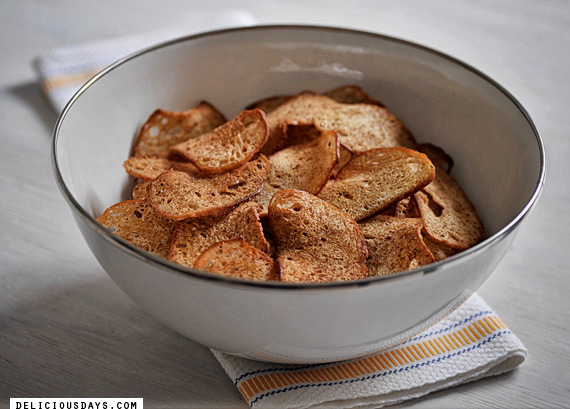 I love to use stale bread for Italian bread salad, but this idea is much better!!!! I like to make this kind of bread chips, too. If you have to much of them, adding the crumbs to the next bread dough is a good possiblity, too. The flavour of the toasted bread adds a very nice nuance to the taste of the bread. This sounds like a recipe I could get addicted to. Will definitely make a batch soon! 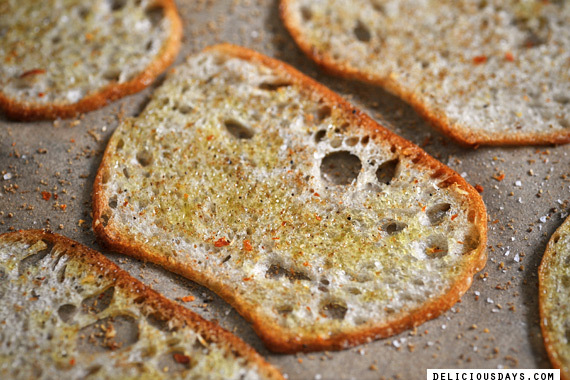 Also, I would love to read a post dedicated to homemade sourdough on delicious:days. I'm just getting started with making my own sourdough at home and am currently trying to really get to understand and handle the magic. This is a great idea Nicky! I love bread but I often buy and bake too much of it. I will give your chips a try! Lovely idea! For how long you do you bake it total? Thank you. Just so natural and neat. Love it ! I bet these taste amazing just as they are with guac. The scent of freshly baked bread makes my kitchen smell like heaven. 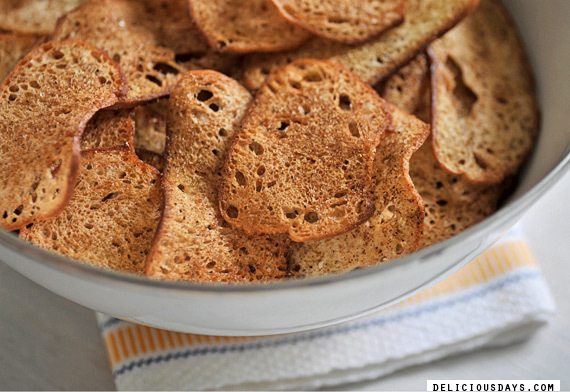 I'm definitely gonna give these spicy bread chips a go. I would also like to make sourdough bread. Can you give me some ideas for good receipes? Great idea, we make these weekly in our commercial kitchens for a wide range of canapes, my favorite is spreading olive paste and pickled octopus onto with fresh herbs!